← review from northside fest! come vomit some glitter w us!! Come to our big party tonight as part of the northside fest. 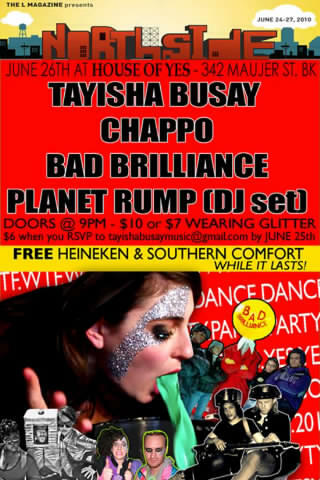 Posted on June 26, 2010, in shows and tagged bad brillance, chappo, glitter, house of yes, northside fest, planet rump, tayisha busay, vomit. Bookmark the permalink. Comments Off on tonite is the night! !.